Out of that musical epiphany blossomed a beautiful songwriting partnership between father and daughter. Moock and Clio spent their first month in the hospital singing and writing songs together. “Singing together in the hospital was transformative, not just for Clio, but for me. It reminded me how powerful music can be,” says Moock. Watching Clio’s spirit come alive as they sang songs like the whimsical “I’m A Little Monkey,” was magical and the driving force that propelled Moock to create Singing Our Way Through: Songs for the World’s Bravest Kids, an inspiring album filled with joyful songs that could touch children and families in the same way. Starting off the album is an acrostic style poem called “I Am The Light” using the word “cancer.” This empowering opener is spoken from the perspective of a “brave kid,” standing strong, able and ready to make the best of the long voyage ahead. Following this song-poem is the funky “When I Get Bald,” a song that embraces the beauty of the changes one faces with this sort of illness. The song’s accompanying video is touching yet light-hearted as it highlights Moock’s knack for artful humor. Moock, a Massachusettes based children’s artist, is a veteran musician with a long-standing career as a folk singer. First, playing for adults and then moving into the children’s genre in 2010 when his children were born. With his signature gravelly voice, à la Louis Armstrong, Moock combines playful lyrics with rootsy melodies, reminiscent of Woody Guthrie. Singing Our Way Through: Songs for the World’s Bravest Kids provides a well rounded account of what life is like “on the inside” of cancer, while also challenging the fear and pain that comes along with it through the healing powers of music. Built on the foundation of love for his daughter and the positive effects the entire process has had on her, Moock has created a vehicle through which he hopes can benefit children and their families in the same way. Singing Our Way Through: Songs For The World’s Bravest Kids is more than just a collection of songs. It’s a companion that seeks to uplift spirits, while providing support and understanding to those who might need a little sunshine through the clouds of any troubling circumstance. A truly powerful album that any family can benefit from. 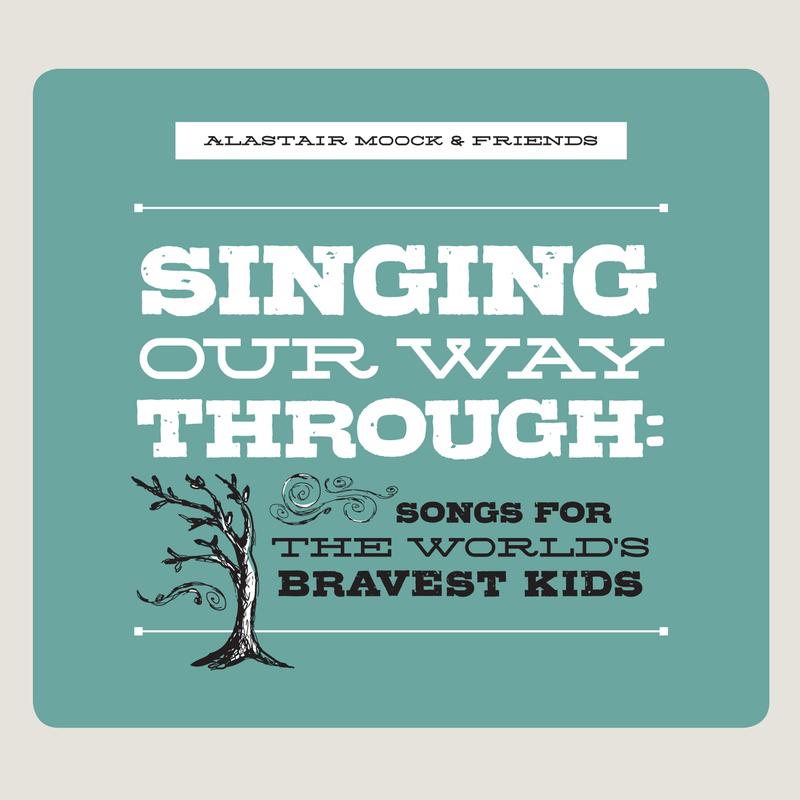 Singing Our Way Through: Songs for the World’s Bravest Kids can be listened to and purchased via the Bandcamp widget below or through the “Singing Our Way Through” store. Donations from the proceeds of this album will help Alastair perform and distribute free albums to patients, hospitals and oncology programs around the country. The Singing Our Way Through project is not — at least for now — a registered non-profit, so your donation is not tax-deductible. But it is much appreciated, and goes a long way to help. Click here to donate.